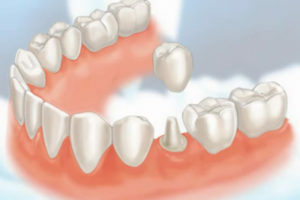 A crown is a type of dental restoration that completely covers a tooth. When tooth structure has been severely compromised by large fillings, decay, or cracks, a crown is the most effective way of restoring the tooth’s strength, appearance and function. Crowns can be made of different materials like porcelain, and gold alloys. They are fabricated in the dental lab and require two office visits to complete. They are bonded to teeth with dental cements and are very durable restorations, providing an excellent result as long as they are maintained with regular hygiene visits and proper brushing and flossing at home.